We would like to congratulate the people of Pakistan on the materialization of their long-awaited dream of a new Pakistan. A Pakistan that would be free from corruption, nepotism, and cronyism. A Pakistan freeing itself from the shackles of mental slavery of political elites and their progeny and taking the matters of charting their destiny into their own hands. A Pakistan where their vote will be given the due respect. Finally, the voters in Pakistan were given the opportunity where their vote would be given the respect it deserves, and they spoke loud and clear by shutting out the corrupt political parties led by corrupt political oligarchs, by throwing their overwhelming support in favour of the true patriotic son of Pakistan, a world class cricketer, turned philanthropist, turned politician – Imran Khan – the Prime Minister in waiting! Trump came into power with a slogan – Make America Great Again. Whether he will live up to his promise only time will tell. However, anyone who knows, follows, and have studied Imran Khan will tell you, he is determined to make Pakistan Great Again! Let there be no doubt, there is a new sheriff in town – Kaptaan. He is one determined and fearless individual. He is not a pushover. He is stubborn and incorruptible. He is not a yes man. He does not mince his words. He is relentless in his pursuits. He does not cow down to outside pressures. He does not know the meaning of impossible. He is not afraid to make tough decisions. He is not two faced. Diplomacy is not his strongest suit. He says what he will do, and he does what he says. He is America’s and India’s worst nightmare. He is unstoppable. Most importantly, he is honest, sincere and he is not corrupt! July 25th, 2018 will forever be recorded in the history of Pakistan as the day Pakistanis finally freeing themselves from the shackles of mental slavery of handful of corrupt political dynasties that have done nothing except looted and squandered Pakistani tax payers wealth over the past four decades into their personal accounts and assets overseas. A decisive and turning point in the history of Pakistan is upon us. For the first time in Pakistan’s history one could say a free and fair election was held, under close supervision of the security forces and Pakistan’s Army, deterring vote rigging, which in past was a modus operandi of the usual political corrupt elites whom had hijacked the political arena for decades in a prefixed dog and pony show which had seen corrupt parties taking turns. One corrupt party led by Asif Ali Zardari, passing the baton to the other corrupt party led by Nawaz Sharif. Taking turns to share the loot and squandering the wealth of average Pakistanis. No more, people have said. The credit of this new political activism and a dawn of new era in Pakistan’s politics goes to none other than Imran Khan, whom have devoted and sacrificed his life and his own personal wealth to serve the people of Pakistan. As of the time of publishing this editorial it is evidently clear that when people were given the chance to vote in a free and fair environment, and for the first-time voters in Pakistan felt that their vote has a value, and it will count. The outcome is obvious and evident to all. The corrupt parties who in past through vote rigging were able to claim landslide victories are ousted barely holding on to quarter of their elected seats. The tsunami, which the corrupt politicians had always feared, has now finally swept them out of power, fighting for the survival of their political existence. Who is Imran Khan? A question many of our readers unfamiliar with the complex Pakistani politics as well as the people throughout the world will be asking. After all, he will soon be leading the only Islamic country with a nuclear bomb and fifth largest army in the world. Michael Kugelman, a US-based analyst at the Woodrow Wilson Centre in Washington, DC, told Al-Jazeera, "For Imran Khan's legion of devoted followers, he represents the new, bold, incorruptible leader that the country has long sought." Khan 65, belongs to an affluent Pashtun family, who was educated at elite academies, such as Aitchison College in Pakistan. He is an Oxford graduate in philosophy, politics, and economics. He is a world class cricketer, who, as a Captain of Pakistan’s national cricket team led Pakistan to its first and only world cup victory in Australia in 1992. Henceforth, nicknamed, “Kaptaan” among his followers. After his mother’s death due to cancer forced him to rethink his priorities in life. He was moved by the fact that there was not a single hospital in Pakistan that could treat his ailing mother. He used his world class celebrity status and his own personal wealth to build a world class cancer hospital in Pakistan, where poor citizens of Pakistan who could not afford expensive cancer treatment receive free treatment. Currently he is working on building third such hospital in Pakistan. He is also credited to building a private technical college, Namal University. He decided to enter politics against the corrupt political dynasties and founded a party, Pakistan Tehrik Insaf, Pakistan Movement of Justice, and in 2002 won its first seat in Pakistan’s parliament. In 2013, his party had garnered enough public support to form a government in the northwest province of Khyber Pukhtunkhwa, KPK – neighbouring Afghanistan – hotbed for terrorist activities and one of the unsafe regions of Pakistan. Five years later, KPK is one of the safest provinces of Pakistan, where public, under his party’s governance witnessed complete overhaul of government administration, starting with the police, healthcare, education, public service, he managed to eradicate corruption, and held his elected official accountable for not serving the people. In 2013 General elections, his party also succeeded in forming the official opposition in the national assembly, where he waged the war, both inside and outside the parliament against corruption and corrupt officials, especially the country’s then Prime Minister, Nawaz Sharif which ultimately led to a an inquiry by the tribunal, where Mr. Sharif was disqualified to hold an office of PM last year. Eventually Nawaz Sharif, his daughter, and son-in-law was found to have been guilty by Pakistan’s Supreme Court and sent to Jail. The people of Pakistan has chosen to change their destiny. 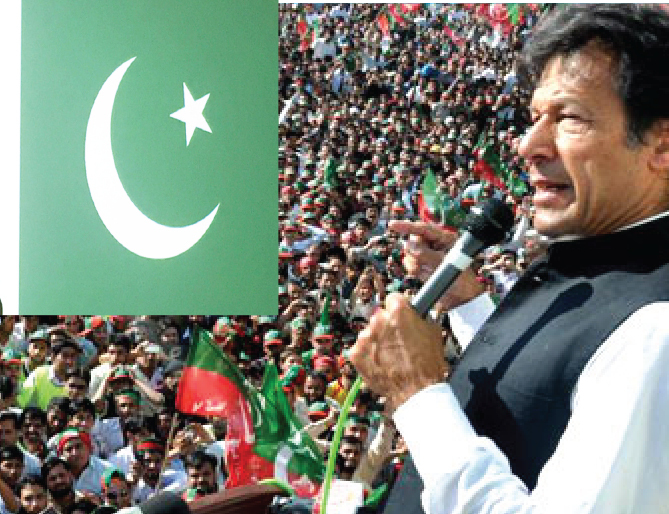 Let us all pray for the people of Pakistan and especially the future Prime Minister of Pakistan, Imran Khan, that may Allah make things easy for him, protect him, keep him steadfast in achieving his goals, and guide him to make the right decisions benefitting Islam and Muslims throughout the world (Aameen).